It’s been a great first quarter for us, and it’s time for a brief update on where we are and where we’re headed. 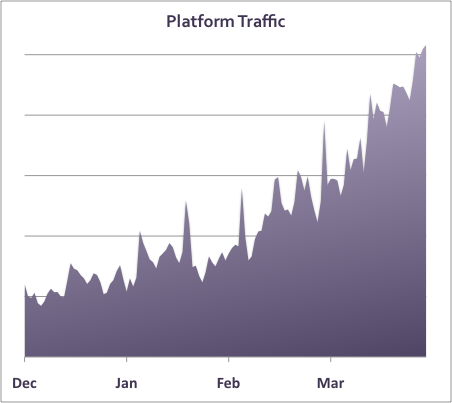 Heroku’s growth has continued to be huge. 1,500 new apps were deployed to Heroku last week alone, and that number increases every week. Next week we will cross the 60,000 application mark. Many are finding great value in the platform and paying for features and scale. Our customer count and revenue have similar growth curves. Where is Heroku’s platform going next? How can you plan for our next releases or influence our direction? When we launch new features, what’s the best way to think about how they fit into our overall strategy? Here’s how we think about our roadmap and decide on big new areas to work on: it’s all about use cases. We started with the simplest use case: making it drop-dead easy for developers to deploy applications, and have grown into more complex ones (like multi-tier complex composite apps). We continue to try and expand the number of use cases that we provide a complete solution for. Provisionless Deployment. Instant deployment with the now famous “git push heroku master” is at the heart of Heroku, enabling the basic use case: a frictionless application platform that just works. Caching and Instant Scaling. We introduced high-speed HTTP caching built into every app, and added dynos which can be scaled up and down instantly, enabling large scale and variable scale apps. Asynchronous Patterns. We added background processing with Delayed::Job, followed shortly by workers which can be scaled up and down just like dynos, enabling many use cases around modern asynchronous architecture. Platform Extensibility. We launched the Add-ons system, a way to extend Heroku apps with core functionality like full-text search or memcache, and to consume external services like New Relic, Zerigo, or Sendgrid. Use cases here are literally endless. Add-ons allow the growing ecosystem of startups and established companies building cloud services to add new features to our platform – many more than we could do on our own. Flexible Runtime. We recently introduced deployment stacks, which enable choice between multiple runtime environments. Over the next days, weeks, and months, we will release new features that continue to expand the number of use cases supported by Heroku, whether for startups or large enterprises. You can be sure that each time we build a feature we will be maniacally focused on simplicity and developer productivity, and will always try to maintain the cohesiveness and quality of the platform. From our core focus on developer productivity and frictionless deployment, we’ll be expanding the footprint to include areas like realtime and event-driven apps, more complex multi-tier applications, and a broader platform for deploying advanced applications. Stay tuned, and let us know where you’d like to see us go.